Pay-per-click marketing is an incredibly powerful advertising tool, offering business large and small a direct pathway to interested customers. But, as with all things, PPC marketing only works if you use it correctly. PPC takes time because a fair amount of data is needed if you want to make informed, profitable campaign decisions and time isn’t exactly a luxury for many agencies and publishers. Dedicating hours to adjust bids, budgets and keywords can be a drain on resources, which is probably why some publishers aren’t experiencing strong returns on PPC campaigns. Some PPC management tools don’t help the situation much, either. We partnered with the Local Search Association to produce a report titled SEM: From Loss-Leader to Profit-Driver, which found that 60% publishers used Google’s Adwords Express as a PPC platform tool. Adwords Express does have some useful functions, but for the most part it doesn’t save publishers much energy or time. Tools for automation are essential when it comes to successful PPC campaigns. Automated PPC tools that utilize machine learning take the effort out of PPC and increase profitability. 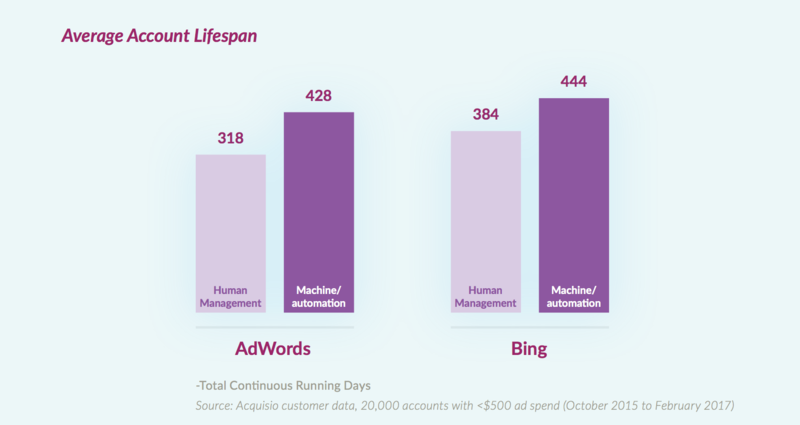 In more ways than one, automation is the key to profitable PPC campaigns through time savings. In case you need a refresher, let’s take a second at what machine learning (ML) means. As we defined in Part 1 of our Digital Predictions Series “machine learning is the subfield of computer science that gives computers the ability to learn without explicitly being programmed.” For the most part, ML algorithms do need to be initially “trained” or receive data sets, but can after be fairly self-sufficient and even predictive. Within the context of PPC, machine learning automates key aspects of campaign management. Keyword selection, bidding, budget management and optimization are all automated with a machine learning PPC tool, taking the most time-consuming aspects of managing a PPC campaign out of the equation. We wanted to figure out exactly how much time PPC campaign managers could save with machine learning. We found that agencies and publishers that are managing small accounts could save 65% of their time using automation. Let’s look at the math to prove how efficient machine learning makes PPC campaign management on small accounts. 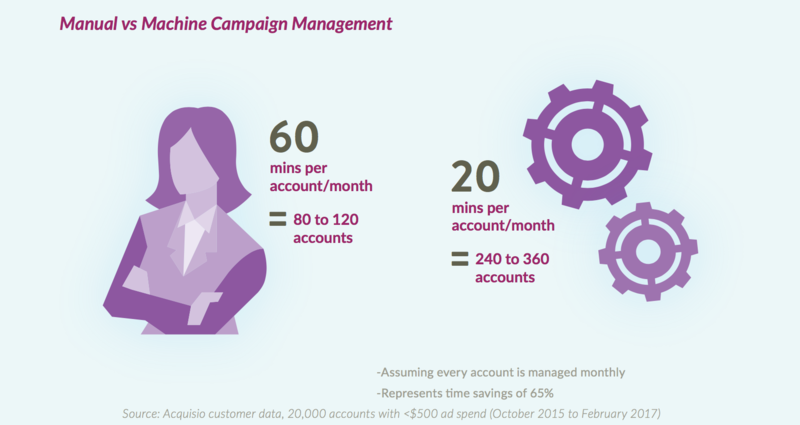 If you’re managing campaigns manually, that adds up to about 60 minutes of work per account, every month. In a 40 hour work week there are 160 work hours per month, which gives a campaign manager enough time to oversee 80 to 120 accounts realistically (sure, 160 accounts if they literally did nothing else at work). When using an ML campaign management tool, the monthly amount of time spent on each account goes down to only 20 minutes. Not only is PPC efficiency increased by 65%, but all that freed up time allows for more accounts, anywhere from 240 to 360 accounts. And for publishers, more accounts means more business! PPC platforms equipped with machine learning algorithms save publishers time and money. But rather than just explain that with the old adage “time is money,” let’s take a look at how, exactly, automation leads to increased profits. The LSA report revealed additional findings about machine learning and PPC performance that are sure to inspire. After reviewing 20,000 local advertising accounts, all of which had a monthly campaign budget under $500, we found that campaigns were 2.5x more likely to reach budget targets on Google Adwords and 7x more likely on Bing Ads because they were using our ML-based campaign management tool. From simple time savings to super-charged optimization, reduced CPC and longer campaigns, machine-learning means increased revenue to anyone serving many small business accounts. Customer-satisfaction generally improves when accounts perform well too. Start Being Efficient, Right Now! 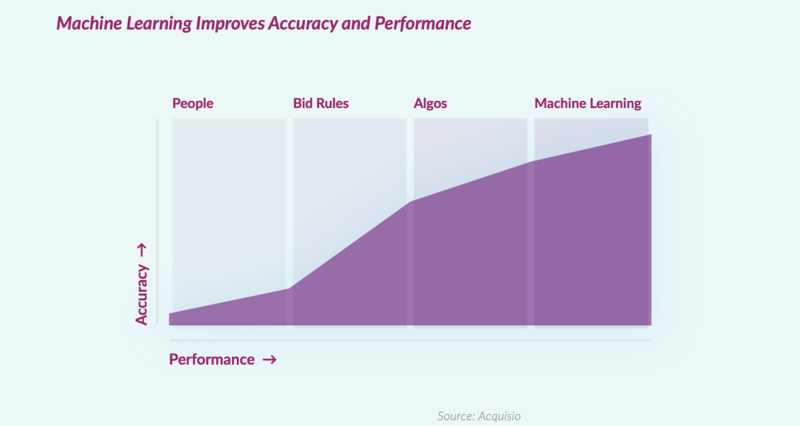 The numbers don’t lie, machine learning makes PPC more efficient. And, perhaps more importantly, more profitable. Campaign managers don’t need to waste hours every week making micro-decisions on PPC campaigns. Instead, let a machine learning tool do all the work. Besides, in most cases, an automized PPC tool can make better bid and budget decisions than a person can anyway! Yes, an automated PPC management platform costs money. But when you factor in how much machine-managed campaigns will save a publisher in labour costs and increase the overall profitability of PPC, the initial price pays for itself. So stop wasting your time with manual PPC management. Be efficient, use machine-based management, and get results! To read the full Local Search Association report, click here!